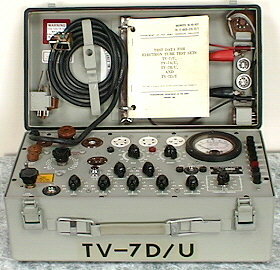 This is a page devoted to the TV-7( )/U family of tube testers. These testers have become very popular for people interested in vacuum tube technology. These are portable units, which a size small enought to carry them easily. Most of them were manufactured in USA by Hickock, although there are other alternate manufacturers, as Stark in Canada. I own a Stark TV-7C/U, S/N 340, which is in fact a TV-7/U internally (circuit) and a TV-7B/U externally (panel and cabinet). Currently I have in my library all of these manuals and supplements. Please, let me know if you have any of the missing ones or if you need any of them. I have put some of the TV-7 Supplement Data online (the ones marked as AVAILABLE below) and plan to add more of them soon. This publication supplements TO 33AA21-5-31, dated 17 January 1962, and replaces TO 33AA21-5-31M, dated 1 May 1973 and TO 33AA21-5-31N, dated 20 September 1973. Dan Nelson (new e-mail!) is one of the best known TV-7 experts. Good source for expert repair, calibration and parts for TV-7 and other testers. Highly recommended. Bill Waters has been doing professional calibrations of all Hickoks for some time and is well known as the 'Hickokdoc' in U.S.